MIT researchers have developed a wearable device that enables blind and vision-impaired people to read any form of printed text without the use of braille. The device is known as the Fingerreader, which is a ring-like device that reads printed text out loud, thanks to a mounted camera and open source software. Users simply strap the wearable device to their index finger, point to an object and any words or even sentences, are detected and read out loud, in real-time. The Fingerreader is able to read multiple words and entire lines of text to the wearer. It also connects to a laptop or a mobile phone, making it versatile and easy to use. It allows the user to take the device with them to read items such as restaurant menus, signs or any other text that is larger than 12-point font. 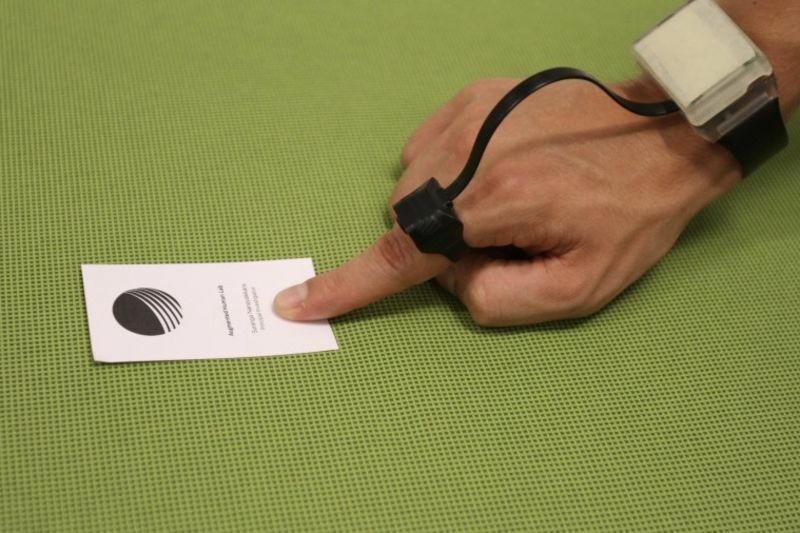 The device also gives vibration-feedback to users if they stray from the text's baseline. Whilst it is only a prototype at the moment researchers hope to attract investors, and soon produce an affordable, marketable device for the public. "With Fingerreader, we aim to transform this proof of concept project into an affordable everyday product that will sustainably change how the visually impaired community can independently access information on the go", according to the Fingerreader's website. You can learn more about the Fingerreader device by watching the video below. Have You Seen This Latest Hand-controlling Device? Video: Blö – The Coolest Wearable, Literally! Video: Tinder Fans, This Gadget Might Just Help You Find Your Soulmate!